The Philippine economy grew by 6.2 percent in 2018, making it among the strongest performers in the East Asia and Pacific region. The Philippines is one of the most dynamic economies in the East Asia and the Pacific region. With increasing urbanization, a growing middle-income class, and a large and young population, the Philippines’ economic dynamism is rooted in strong consumer demand supported by vibrant labor market and robust remittances. Business activities are buoyant with notable performance in the services sector including the business process outsourcing, real estate, and finance and insurance industries. Sound economic fundamentals and a globally recognized competitive workforce reinforce the growth momentum. Having sustained an average annual growth of 6.3 percent between 2010-2017 from an average of 4.5 percent between 2000-2009, the country is poised to make the leap from a lower-middle income country with a gross national income per capita of US$3,660 in 2017 to an upper-middle income country (per capita income range of US$3,896 – 12,055) in the near term. 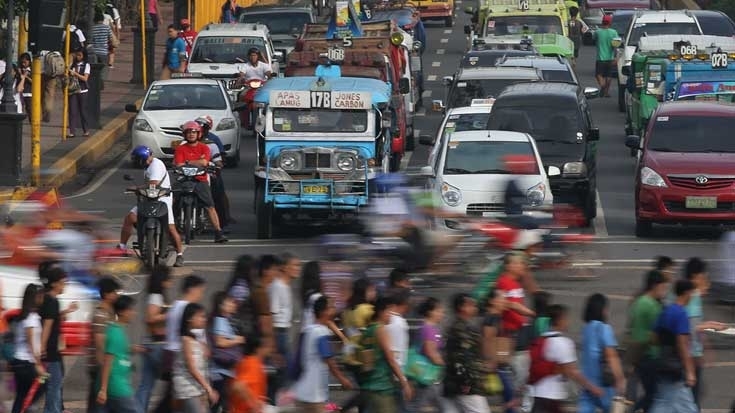 In 2018, Philippine economic growth moderated to 6.2 percent from 6.7 percent in 2017, dragged down by lower growth in global trade and domestic high inflation. In 2019, however, growth is projected to reach 6.4 percent as inflation winds down and spending due to the upcoming midterm elections is likely to boost private consumption growth. Export growth, however, is likely to remain weak, as global growth and trade activities are projected to moderate in the medium term. The government is expected to continue its expansionary fiscal policy agenda, while the BSP may take a pause in its tightening stance as inflationary pressure diminishes. The country will sustain this growth momentum with a growth forecast of 6.5 percent in 2020 and 2021. In recent years, the Philippine economy has made progress in delivering inclusive growth, evidenced by the declining poverty rates and a falling Gini coefficient. Poverty declined from 26.6 percent in 2006 to 21.6 percent in 2015 while Gini coefficient declined from 42.9 to 40.1 over the same period. Unemployment has reached historic low rates but underemployment remains high, near its 18-20 percent decade-long average. Although a large share of Filipino workers transitioned out of agriculture, most of them end up in low-end service jobs. Thus, while employment increased between 2006 and 2015, average wages remained stagnant. Measures to generate good jobs and better wages therefore are essential to achieve shared prosperity. The World Bank Group’s (WBG) partnership with the Philippines spans more than 70 years, providing longstanding support for infrastructure as well as engagement in key sectors including governance, social protection, water resources, and disaster risk management. The WBG is also an active partner in helping spur private sector growth, expanding engagement with civil society, and promoting peace and development in Mindanao. Peace, institution building, and social and economic opportunity: supporting governance, social and economic development and citizen security and justice in conflict-affected regions in Mindanao, including the territory of the proposed new Bangsamoro autonomous political entity. Through funding assistance, technical advice and knowledge, the World Bank Group has been responsive to the country’s development priorities as reflected in the Philippine Development Plan 2017-2022. The World Bank Group focuses on peace-building and development in Mindanao. The Bank supports government’s efforts to enhance agricultural productivity and connectivity from farm to market; boost education, skills, and employability of the youth; and help promote peace and development. The World Bank’s support to the country cuts across several sectors that includes agriculture, social development, disaster risk management, social protection, water, education, transport, and energy. As of end of March 2019, the Bank's active portfolio in the Philippines consisted of 11 operations financed by IBRD loans, GEF grants, and large recipient executed grants with total net commitment of US$3.2 billion (including one CAT-DDO operation of US$500 million and one DPL of US$450 million). The IBRD portfolio’s sectoral coverage is as follows: agriculture (21%); social development (15%); disaster risk management (15%); social protection (14%); water (15%); transport (5%); energy (1%); and macro-economic and investment (14%). In terms of trust funds, the Philippines trust fund portfolio consisted of 72 active grants with total commitment of $197.9 million, of which 18.2% are Bank executed. Of the total TF portfolio, 66.9% of commitments is fully integrated in the loans/investment portfolio in terms of processing and monitoring. Of the share of Bank-executed grant commitments, 38% supports advisory services and analytics (ASA). IFC has an active advisory service program in the country, focusing on enhancing investment climate, public private partnership projects, climate finance, financial inclusion, disaster insurance and sustainable agribusiness. The Philippines is currently preparing a Systematic Country Diagnostic (SCD) report in consultation with the Philippine government, private sector, civil society, and other stakeholders. It is a diagnostic exercise to identify key challenges and opportunities to accelerate progress in poverty reduction and shared prosperity in the Philippines. The SCD will provide important inputs in the preparation of the World Bank’s Country Partnership Framework covering 2020 and beyond. Since the Philippines government received its first World Bank loan in 1957, the Bank has financed development projects which have produced significant results for its people. In the last three decades, the Bank’s assistance has expanded to a wide range of projects and analytical work, policy advice and capacity development in support of the country’s development agenda. The Philippine Rural Development Project (PRDP), started in 2015, has been helping raise rural incomes, enhance farm and fishery productivity, and improve market access throughout the country. It has been supporting provincial planning, rural infrastructure and agriculture enterprise development. It has been using tools such as geotagging, value chain analysis and expanded vulnerability and suitability assessments to help guide public investments toward a modern, value-chain oriented, and climate-resilient agriculture and fisheries sector. Since 2015, the project has helped support provincial planning for priority agricultural commodities in all 81 provinces of the country. 415 km of rural road improvements have been completed with an additional 1,600 km being improved, benefiting 600,000 households, also supporting irrigation, potable water systems, warehouses and other post-harvest facilities. 126,000 beneficiaries received support through 610 agriculture enterprise projects and improved provincial planning further resulted in provinces being able to mobilize an additional US$ 700 million of funds for identified priority investments in agriculture. The Participatory Irrigation Development Project (PIDP) has been supporting the improvement of 58 irrigation systems throughout the country. Since it started in late 2009, the project has rehabilitated and modernized irrigation infrastructure that has been serving close to 126,180 hectares, benefiting close to 196,440 farmers, and their families. It has also provided organizational development and capacity building activities to more than 924 Irrigators’ Associations. The Bank has been supporting the government’s education agenda through the Learning, Equity and Accountability Program Support (LEAPS) project in the areas of early grade reading and math with a focus on disadvantaged children. The Project has benefitted approximately 4.4 million students, teachers, school heads and other Department of Education staff in terms of improved teaching and learning in reading and mathematics. Specifically, the project has trained approximately 34,000 Grade 1 – 3 teachers and 10,000 school heads in early literacy and numeracy teaching strategies. Good improvements have been recorded in reading and math scores of Grade 2 and 3 students. LEAPS has also successfully supported the development and roll-out of a department of education-wide financial management and operations manual and has trained 14,121 target schools in the new performance incentive scheme. Approximately 21,000 schools received training in the new school report card utilization and have reviewed three education programs focused on supporting disadvantaged learners. The Social Welfare and Development Reform Project II (SWDRP II) has continued supporting the government’s conditional cash transfer program (CCT) or Pantawid Pamilyang Pilipino Program, which is helping poor households invest in the education and health of children up to 18 years old. The program has made significant impact on reducing total poverty and food poverty among beneficiaries, and has grown to become one of the largest in the world, supporting more than 4.4 million as of April 2019. The Pantawid Program has increased gross enrollment rates for children ages 12–17 years by 4.9 percentage points from a baseline of 80.4 percent, and by 10 percentage points (from a baseline of 60.8 percent) for ages 16-17. The program is also helping reduce the gender gap in enrollment between boys and girls ages 6–14 years by 30 percent. Pantawid is encouraging poor women to use maternal and child health services such as antenatal care: nearly 8 in 10 pregnant women of Pantawid households avail the recommended number of prenatal checkups. It also promotes safer birth deliveries performed by doctors and improved children’s access to certain health care services, which all have positive effects on the long-term welfare of beneficiary households. The project Beneficiaries of the CCT are selected through Listahanan, the national household targeting system for poverty reduction in the Philippines, that reaches three out of four households across the country. The objective selection of 5.2 million poor households in 2016 has helped ensure that government programs are better targeted for those who need it most. Given the project’s success, the Bank is providing additional financing to the SWDRP II for the period 2019-2021. The CCT is being implemented in 145 cities and 1,482 municipalities in 80 provinces in the country. The poorest communities have benefited from projects that address their priority needs through a community-driven development approach. As of June 30, 2018, the National Community-Driven Development Project (NCDDP) has covered a total of 18,781 barangays (villages) in 800 municipalities. It has funded a total of 26,247 community sub-projects, of which 91% has been completed. The completed community sub-projects reached approximately 5.9 million household beneficiaries (70 percent of 8.4 million target). The community-managed implementation of sub-projects has also provided temporary employment for a cumulative total of 371,341 community members (61% of who are female) thereby providing about US$21M cash -for-work. Supported community sub-projects include basic access facilities (access roads, footbridge), basic social services such as health clinics, schools, day care centers and water systems as well as facilities for flood/erosion control and environmental protection. To manage the risks posed by natural disasters, the Bank has provided a contingent line of credit for moderate to severe disasters, as well as an innovative catastrophe insurance coverage for the most severe and infrequent events. This is combined with technical assistance to help strengthen investment planning and regulations to reduce disaster risk, particularly through support for the revision of the National Building Code. The innovative financing helps ensure that resources are available for the government’s development programs in the aftermath of a disaster. With its global expertise in post-disaster reconstruction, the Bank has been working with development partners and the government in helping develop effective disaster recovery programs and building back better infrastructure and communities. The Bank’s assistance has also extended to conflict-affected areas in the country, helping support better governance, access to services, jobs creation and enhanced citizen security and justice. The Mindanao Trust Fund-Reconstruction and Development Project has been supported by a range of development partners and aims to improve prospects for peace and development in conflict-affected areas in Mindanao by improving the social and economic recovery. Results delivered include 573 sub-projects that improved infrastructure, strengthened livelihoods and functional literacy in 315 conflict-affected communities across 75 municipalities. Nearly 650,000 people now benefit from clean water, better roads, more post-harvest facilities and access to farming and fishing equipment. Find out what the Bank Group's branches are doing in Philippines. The government's primary mechanism to facilitate substantive policy dialogue among stakeholders on the country’s development agenda. Check out this newsletter on monthly economic developments in the Philippines. Our projects cover education, community-driven development, water and sanitation, and poverty-reduction in Mindanao. Get to know the partnership between the World Bank and schools, policy and research institutions.